Found on Pinterest with no source. Well, if I were really a rabbit I imagine that is what would make me happy, or maybe some fresh baby garden greens. Yum, our garden is right on track for us to have some of both soon. Either way, my wardrobe rescue mission seems to be on track. Yesterday morning as I was getting out of bed my boyfriend asked “are you losing weight?” Why yes, YES, I am. The scale seems to agree with his assessment and I’ll give you a full update on Monday including my plan to keep it going. 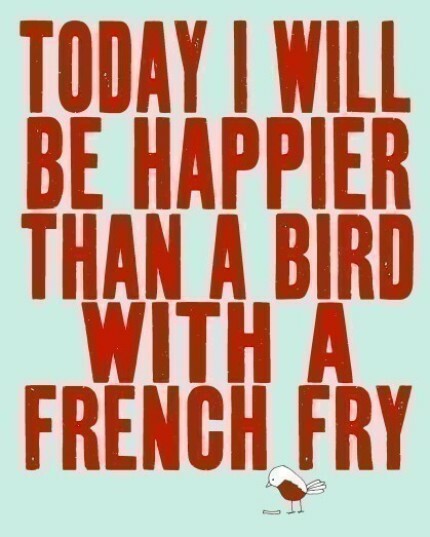 For now, I hope your weekend makes you as happy as a bird with a french fry or maybe a picky rabbit with a carrot.